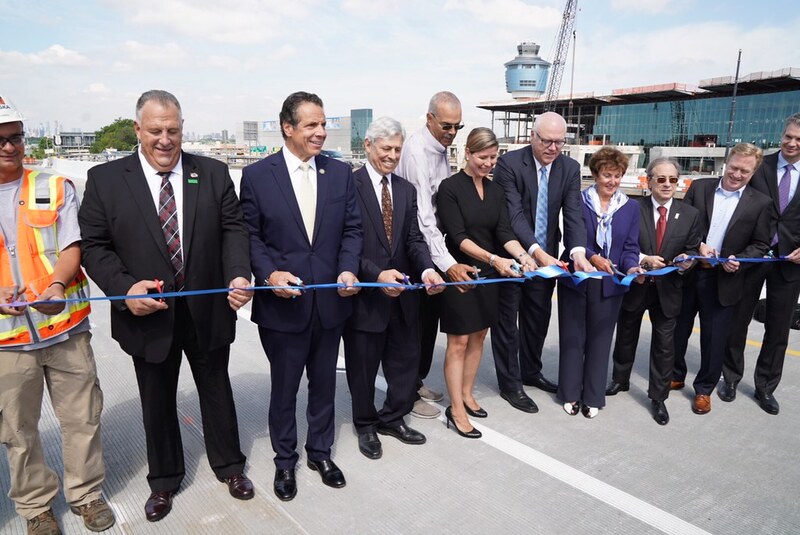 Governor Andrew M. Cuomo today announced the completion of a major new roadway flyover that will enhance access and improve traffic flow for travelers driving into LaGuardia Airport. At its opening, the new flyover, located at the Grand Central Parkway's eastbound Exit 7, will be the primary access point for vehicles going to the eastern side of LaGuardia Airport where Delta's gates are located. Construction of the flyover was completed in less than two years and marks a significant step in the ongoing $8 billion LaGuardia Airport modernization project that Governor Cuomo announced in 2015. "This new flyover will bring immediate relief to travelers driving to LaGuardia Airport, and is a key milestone in our plan to build the nation's first new airport in more than 20 years and make it a world-class international gateway," Governor Cuomo said. "While the federal government pays lip service to infrastructure, New York is making historic strides in building a transportation network fit for the 21st century economy." Governor Cuomo also announced $1.4 million in new funding for the Council for Airport Opportunity, working with Elmcor Youth and Adult Activities and Neighborhood Housing Services, to build a new office in East Elmhurst/Corona near LaGuardia Airport that will focus on providing opportunities for local residents to benefit from the airport's redevelopment. The Council for Airport Opportunity is a nonprofit organization that provides airport-related recruitment and job placement services to Queens residents, including those who are minority and disadvantaged. With nearly 18,000 vehicles traveling to LGA daily, the eastbound Grand Central Parkway Exit 7 flyover is anticipated to handle 20 percent initially of the airport's total inbound traffic. This entry is one of four current access points to LaGuardia, with the others being Grand Central Parkway Westbound Exit 7, 94th Street northbound for local traffic and Marine Terminal Drive off 82nd Street, also for local vehicles. The new flyover is designed to provide a more direct route for vehicles traveling to the eastern side of the airport, where Delta's gates and operations are located. Previously, those vehicles had to navigate a labyrinth route and execute a 360-degree turn, while encountering various traffic lights along the way. Vehicles headed to Terminal B will also benefit by having a new direct connection to the arrivals level, separated from traffic to the other terminals. The overall $8 billion modernization of LaGuardia Airport - which includes the flyover - continues to reach key milestones. In February, the new Terminal B garage opened, with a dedicated level for Uber, Lyft and other car services to increase customer convenience. The first gates at the new Terminal B will open later this year and Delta's new Terminal C is showing rapid progress after breaking ground only a year ago. The new Terminal B, which will replace the current outmoded 54-year-old Terminal B, is slated for completion in 2021. The new Delta Arrivals and Departures Hall will also open in 2021. Twenty-six new planned bridges/flyovers will replace 15 existing bridges and significantly eliminate the need for on-airport traffic signals. Prior to the start of the modernization program, there were 19 traffic signals for drivers to navigate at Terminals B, C and D. Following completion of the modernization project, only three of those 19 traffic signals are expected to remain. Most of the on-airport road crossings will have been eliminated by raising traffic up onto bridges, sometimes three levels high. This new flyover will bring immediate relief to travelers driving to LaGuardia Airport, and is a key milestone in our plan to build the nation's first new airport in more than 20 years and make it a world-class international gateway. Skanska, a civilian construction group, is building the new roadway/bridge system. This division of Skanska has its national headquarters of more than 7,000 white- and blue-collar workers based in nearby East Elmhurst, Queens. The Port Authority has allotted $625 million to new roadway/bridge construction as part of the overall $8 billion LaGuardia Airport modernization project. This includes LaGuardia Gateway Partners work on the western half of the airport and Delta's rebuilding of the entire eastern half of the airport to replace existing Terminals C and D.
Essentially creating a new airport atop an existing airport while minimizing customer inconvenience requires extensive planning and phasing of projects. To that end, roadway and bridge, and parking and terminal milestones have begun and will continue occurring over the next several years. Apart from the terminal and roadway and bridge investments, the Port Authority has committed $1.5 billion in its current 10-year capital plan for an AirTrain LaGuardia to link the airport by rail at Willets Point to the Long Island Rail Road and MTA's 7 subway line. The air train will provide a reliable trip to LaGuardia from Midtown Manhattan in less than 30 minutes. An environmental impact assessment of the project is slated to begin soon. LaGuardia Airport handled 29.5 million passengers in 2017, with significant passenger growth forecast in the coming decades. This March, April and May each had the highest monthly passenger volumes in the airport's history, despite the ongoing construction. The Port Authority of New York and New Jersey will directly invest $1.2 million in the expansion of community-based organizational efforts to provide job skills training, interview preparation and employment opportunities to local residents. Airlines serving LaGuardia will also contribute to the expansion through a $200,000 contribution from CAO. The expansion was approved last week at CAO's regular board meeting. Elmcor Youth and Adult Activities and Neighborhood Housing Services (NHS), two organizations with longstanding ties to the communities adjacent to and around the airport, will partner with CAO to identify and refer local job seekers looking to be part of the airport's future. A satellite office will be opened within Elmcor's existing space at 107-20 Northern Boulevard where four dedicated employees will perform outreach to local communities, provide enhanced job development and training programs, make qualified job seeker referrals to the airlines as well as full spectrum of airport employers, and manage program initiatives toward success from initial intake through job placement. The expansion of CAO is part of Governor Cuomo's ongoing $8 billion modernization of LaGuardia, and is intended to maximize access to job opportunities for local residents, both during the redevelopment and beyond. Once the new satellite office is opened later this fall, local residents will have greatly enhanced access to CAO's suite of job placement and job readiness services five days a week within the local community. Currently, residents of these neighborhoods can only access CAO services on airport once a week or at CAO's Jamaica, Queens Career Center. CAO recruits candidates for airport employment and provides them with job readiness counseling, career orientation and instruction in interviewing skills and job search techniques. Elmcor and NHS will add their in-depth knowledge of the community to ensure that the new CAO office reaches all local residents seeking to benefit from economic opportunities at LGA. Port Authority Executive Director Rick Cotton said, "Under Gov. Cuomo's leadership, LaGuardia will be the first entirely new airport built in the U.S. in more than 20 years. The new LaGuardia will give New York the world-class facility that customers rightly expect. "A critical part of this complex effort is ensuring improved airport access and traffic flow through a completely rebuilt roadway network, and this flyover opening is a major step toward that goal." Congressman Joe Crowley (D-Queens, the Bronx), Chairman of the House Democratic Caucus said, "The LaGuardia Airport Redevelopment program is a crucial and ambitious infrastructure project that will greatly benefit Queens and all of New York. The expansion of the Council for Airport Opportunity and today's announcement of new transportation options to ease travelers' commutes marks yet another promising step forward for the program. This new flyover will offer travelers a more direct route into LaGuardia, which will alleviate traffic congestion surrounding the airport, a top priority for Queens residents like myself. The CAO's expansion will create new, high-quality jobs right here in Queens, which will ensure that LaGuardia's redevelopment continues to elevate families living in our communities. Today's announcement demonstrates why New Yorkers are so excited for the benefits a new and improved LaGuardia will bring to our city. I thank Governor Cuomo for his leadership on this crucial project." Assemblyman and Speaker Pro Tempore Jeffrion Aubry said, “This new flyover ramp is the latest milestone in the transformative LaGuardia Airport project, and I thank Governor Cuomo for his leadership on this project. I have also for years worked with the Council for Airport Opportunity to provide the communities that surround LaGuardia Airport with access to employment and business opportunities. So I am especially delighted that CAO will now have local offices to provide these services. Elmcor and NHS are excellent partners and have great histories of service in our communities." New York City Council Member Francisco Moya said, "The grand opening of the new ramp to LaGuardia Airport marks a watershed moment in modernizing this facility and bringing it up to the standards expected of New York City. I want to thank Gov. Cuomo for advocating to make LaGuardia a place we can be proud of. I also applaud the CAO and Port Authority for partnering with two fantastic community groups in Elmcor and NHS and their effort to expand job opportunities and prioritize local around the airport. Since its inception, LaGuardia Airport has directly affected the wellbeing of its neighbors in East Elmhurst and Corona; this investment is an acknowledgment that we can all grow together." Building & Construction Trades Council of Greater NY President Gary LaBarbera said, "Under Governor Cuomo's leadership, we are building bigger and better all across the state. With his building vision and his commitment to union labor at every step of the way, Governor Cuomo is setting an example of how it's done for the rest of the country to follow, and there is no better testament to the Governor's commitment to rebuilding our infrastructure than the project to build a new LaGuardia, and this is the latest milestone in that transformative project. The men and women of the NYC Building Trades are proud to be working on this world-class project, and we are grateful for the leadership of Governor Cuomo." Stewart Steeves, Chief Executive Officer of LaGuardia Gateway Partners, the private entity operating and rebuilding Terminal B said, "LaGuardia Gateway Partners is proud to celebrate the opening of the new flyover, designed to help ease traffic flow - yet another milestone achieved towards the redevelopment of LaGuardia Airport. We are working tirelessly to build the new reimagined world-class Terminal B and we are grateful for Governor Cuomo's leadership and the partnership of the Port Authority as we work to fulfill the Governor's vision for a unified LaGuardia Airport." Paul Hewins, President of Skanska USA Building and managing partner of the Skanska Walsh Joint Venture said, "Today's opening marks another important milestone in Governor Cuomo's vision to remake LaGuardia into a 21st century airport through the largest public-private partnership in U.S. aviation history. Travelers will benefit from a direct route to Terminals C and D, and the surrounding community will also see benefits like Skanska Walsh's upcoming investment of nearly $2 million in facilities for the Elmjack Little League who serve the neighborhoods of Astoria, Elmhurst and Jackson Heights." Henry Kuykendall, Delta's Senior Vice President - Northeast Airport Operations said, "One year out from the groundbreaking of Delta's all-new home in Queens, we're honored to be here with Gov. Cuomo to open this flyover ramp, one of many more milestones to come. Today's opening means quicker access into and out of LGA for Delta customers as we look forward to the end of 2019 when we have our first all-new concourse open for flying. We thank the Governor, our customers and our employees for their continued support." Council for Airport Opportunity NY & NJ Executive Director, Andrew Campbell said, "CAO is excited for the opportunity to expand services directly to the community surrounding LaGuardia airport. By partnering with Elmcor and NHS, with their complementary program experience, we will generate greater and easier access to airport careers for local residents. We commend Governor Cuomo, the Port Authority and local elected officials for their foresight in recognizing community needs and supporting this initiative, thus ensuring there is opportunity for residents to secure jobs and share in the region's economic growth." Elmcor Executive Director Saeeda Dunston said, "Elmcor values the partnerships that we have developed over the past 53 years in the Queens communities, to provide quality services and opportunities to those we serve. This enhanced partnership with CAO and NHS, funded by The Port Authority of NY&NJ is truly aligned with our mission to foster positive life changes for individuals and families through skills development leading to self-sufficiency. Economic development has been a critical component of our work in the local community over the years and we are excited to continue that work with the CAO and NHS. With the support of Governor Cuomo, local elected officials and the Port Authority, this will allow our residents in Queens to participate in the employment opportunities at LaGuardia Airport, that is right here in their own back yards." Neighborhood Housing Services Executive Director, Yoselin Genao-Estrella said, "Neighborhood Housing Services of Queens is thrilled to partner with our colleagues at the Council for Airport Opportunity and Elmcor. We welcome the opportunity to continue to serve as a bridge between local economic opportunities and the residents of Queens. A skilled local hire program will be a game-changer for our local workforce and we applaud Governor Cuomo and the Port Authority for the trailblazing approach and investment in the residents of Queens. We are excited to continue to build on our shared vision of providing access to job opportunities, job development and training programs."